After another devastating loss in the previous year's Classic, a different New York Yankees team returned to represent the American League in 1964. Yogi Berra had replaced Ralph Houk at the helm and under his guidance, the Yanks managed to barely win the American League pennant by a single game over the Chicago White Sox. It was the fifteenth World Series for the former Yankee catcher as Berra had first appeared in the contest in 1947 and went on play in a record seventy-five games before his last outing in 1963. Many of his former teammates had remained in New York as Mickey Mantle prepared to play in his twelfth postseason exhibition, Whitey Ford entered his eleventh and Bobby Richardson posted his ninth appearance. Roger Maris, who was only in his fifth season as a Yankee, had never missed the World Series since donning the blue pinstripes. Their opponents, the St. Louis Cardinals had just missed the previous year's contest by finishing six games behind the Los Angeles Dodgers (who had dethroned the once-mighty Yankees in a four game sweep) and were determined to follow suite. Much like their American League rivals though, the Cards had a lot of luck to thank for their latest post-season opportunity. First the Nationals lost their General Manager in mid-August, but managed to climb from fifth to first (with considerable help from the Philadelphia Phillies, who blew a 6½ game league lead with twelve games to play). Whitey Ford, always a postseason standout, held onto a 4-2 lead going into the sixth inning of the opener, but St. Louis right fielder Mike Shannon hammered a long two run homer off the veteran lefty and when catcher Tim McCarver followed with a double, the thirty-five year-old Ford was through for the day, and (because of arm problems) the Series. The 9-5 loss of Game 1 as well as their #1 ace should have been a sign for what was to come as the Yanks were now experiencing a new kind of streak… a losing one. The opening fiasco was their fifth consecutive loss in World Series play and for the first time (in a long time) the Yankees were the underdogs. In an attempt to jumpstart his team, Berra gave the Game 2 ball to an up-and-coming rookie named Mel Stottlemyre who went against Cardinal ace Bob Gibson. Stottlemyre had thrown strong down the home stretch (after getting called up from Richmond in August) and was a deciding factor for New York in the close American League pennant race. Both pitchers stood firm until Gibson left the game and his relief surrendered four ninth inning runs for an 8-3 loss that put the "Bombers" back in the race. Game 3 followed the same script as veteran Curt Simmons and the Yankees' Jim Bouton were locked in a 1-1 tie through eight innings. Manager Johnny Keane used a pinch-hitter for Simmons in the ninth as the Cards threatened, but failed, to score. Barney Schultz, a clutch reliever for St. Louis, entered the game in the bottom of the ninth and threw one pitch, which Mantle promptly launched into the right-field stands for the 2-1 win. Ray Sadecki started Game 4 against the Yanks Al Downing, but was taken for three quick first inning runs. Downing faired better and protected the lead going into the fifth, but the lefty was nailed by Ken Boyer for a grand-slam in the following inning. With relievers Roger Craig and Ron Taylor combining for 8 2/3 innings of two hit, scoreless relief, St. Louis went on to even the Series with a 4-3 victory. Bob Gibson returned for Game 5 and was one out away from a 2-0 victory when the Yanks' Tom Tresh ripped a two run homer that tied it up. Gibson prevailed however, after Tim McCarver came up huge with a three run blast off of Yanks reliever Pete Mikkelsen for the 5-3 victory. Game 6 witnessed yet another nail-biter as the contest remained tied 1-1 going into the sixth. This time it was the Yankees coming up big with two consecutive home runs by Mantle and Maris and a grand slam by Joe Pepitone off reliever Gordon Richardson in the eighth. When it was over, New York had won 8-3 while staying alive and forcing a final Game 7. Stottlemyre and Gibson both returned for the climatic finale and held each other scoreless through three innings. Then the Cardinals broke loose for three runs in the fourth and three more in the fifth, touched off by a home run by Lou Brock. Brock (a mid-June acquisition from the Cubs) proved to be a brilliant investment during the regular season after stealing thirty-three bases and batting .348 in one-hundred three games. Mantle responded with a three run homer in the sixth and Clete Boyer and Phil Linz both followed "The Mick's" lead in the ninth. Despite their efforts, Gibson stood tall and finished the complete-game with a 7-5 Cardinal triumph. The Boyer brothers had both come up big for their respective teams and set a record as the first set of brothers to hit home runs in the same Series. Ken had contributed two for St. Louis and Clete added one for New York (with one for each coming in the same game). For the Cardinals, it was the end of a long postseason drought as they had not appeared in the Fall Classic since 1946. For the Yankees, it was the end of an era as the perennial champions were about to start a drought of their own. Within two years, the American League dynasty would fall from first to last and it would be several years before returning to their former glory (twelve years). 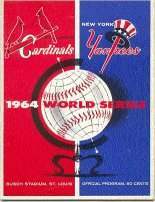 It was the last World Series appearance for many regulars including Mantle (who set the all-time Series home run record at eighteen), Ford, Richardson, Kubek and Boyer. Howard would appear in the Classic once more (with the Boston Red Sox) and Maris was destined to play in two more with the Cardinals. Both managers were no longer at the helm after the Series (Berra was fired & Keane resigned), but in a strange twist, it would be the unemployed Cardinals skipper Johnny Keane who resurfaced in a Yankees uniform as Yogi Berra's replacement. Did you know that on October 16, 1964 (one day after Game 7 ), both managers were unemployed? The New York Yankees fired Yogi Berra and Johnny Keane of the St. Louis Cardinals quit due to his unhappiness with the handling of Bing Devine's (the General Manager) termination. Trivia Alert: Can you name the only player to appear on a World Series roster without playing a single Major League game? Late in the 1964 season, Tony Kubek was playing injured and Manager Yogi Berra called up Chet Trail from Double-A ball. Trail never appeared in a single Major League game and Berra kept him on his roster during the 1964 World Series making him the only non-Major League player to appear on a twenty-five man World Series roster. During the 1932 World Series , Babe Ruth hit his fifteenth and final World Series home run. On October 10, 1964 , Mickey Mantle led off the ninth inning with a right field game winning blast that landed in the upper deck and broke the record set by the Bambino thirty-two years earlier.